After leaving the names Kenny & The Cadets, Carl & The Passions and then The Pendletones behind to become the Beach Boys in 1961, the Wilson brothers, Brian, Carl and Dennis and their cousin Mike Love hit upon a style of music which no-one could match. The surf sound, as it became known, was influenced by the doo-wop groups of the fifties which their father, Murry Wilson played endlessly, especially the Four Freshmen. Brian was fascinated by the sound and taught his brothers how to sing harmonies that eventually became their trademark. The Beach Boys name was not the choice of the members. Murry took demos of his sons’ music to Herb Newman who was the owner of Candix records and he signed them immediately. A few months later when the label boss sent the boys their own box of demos of what was to be their first single, the discovered it was credited to The Beach Boys. Murry rang Newman to find out what was going on and was told that they wanted to give them the name The Surfers to directly associate them with the increasingly-popular teen sport. But it was Russ Regan, who was a promotions man with the label who realised there was already a band called The Surfers so it was his suggestion to call them The Beach Boys. They became instantly popular on the both side of the Atlantic with lively, upbeat songs like Surfin’ Safari, Fun Fun Fun, Surfin’ U.S.A., Surfer Girl, Little Deuce Coupe, I Get Around and California Girls, but by 1968 their popularity in the States had waned. The Pet Sounds album was a relative failure when it ‘only’ reached number 10 in the States and number two on these shores. Their approach had changed from the straightforward songs about surfing and hot rod racing because Brian had instigated changes and the lead vocalist, Mike Love, was unhappy about them. He liked the old songs and wanted to ‘do it again’. 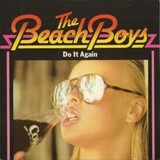 Do It Again, which had the original working title Rendezvous, features a trumpet-like sound during the wordless chorus, but it’s actually Brian Wilson using a falsetto voice and the intro has a unique sound and was created by adding a long echo delay and the song became the band’s first chart-topper in Australia. Incidentally, the single version is slightly different to the album version, as it doesn’t feature the hammering sounds on the fade out. Brian began work on the follow-up album Smile with the intention of taking the innovation of Pet Sounds to the next level. Many of the vocal and instrumental tracks were laid down, but due to family and record company pressures, the project was abandoned. Some of the tracks turned up on bootlegs in the eighties, and a bootleg version of the album was released in 2001. The next album was Smiley Smile, a completely different project from Smile, although it is rumoured that much of the material would probably have been used on Smile anyway. The album which was described by Carl Wilson as “A bunt instead of a grand slam”, missed the US Top 40 altogether, but was considerably more successful in the UK, where it reached number nine. In 2004 Smile eventually officially saw the light of day when it was released with the artist credit, Brian Wilson Presents… and it reached a respectable number seven. However, it only spent four weeks on the chart so I guess the long-awaited intrigue didn’t impress that much. Although Good Vibrations had topped both the UK and US charts, it was their last US Top 10 hit for almost 10 years. Their American fans presumably preferred the ‘surf sound’ that was synonymous with The Beach Boys. In the UK, they had further top 10 hits with I Can Hear music (1969), Breakaway (1970), Lady Lynda (1979) and finally, as part of a collaboration with the Fat Boys in 1987, on Wipeout which took them to number two only held off by the year’s biggest seller, Rick Astley’s Never Gonna Give you Up. The song seems to appear in movies every 10 years beginning with One Crazy Summer (1986), Flipper (1996) and Happy Feet (2006). The ‘did-its’ in this song inspired Eric Carmen to write the song She Did It which appeared on his 1977 album Boats Against the Current. Do It Again appeared on the 20/20 album in 1969, which was only made to fulfil contractual obligations to Capitol Records and featured leftover tracks and singles. It also included the song Never Learn Not to Love, written by the notorious serial killer Charles Manson, although later pressings credited it to Dennis Wilson. In 1969, a year after the Russian Revolution, The Beach Boys became the first Western group to perform in Czechoslovakia.